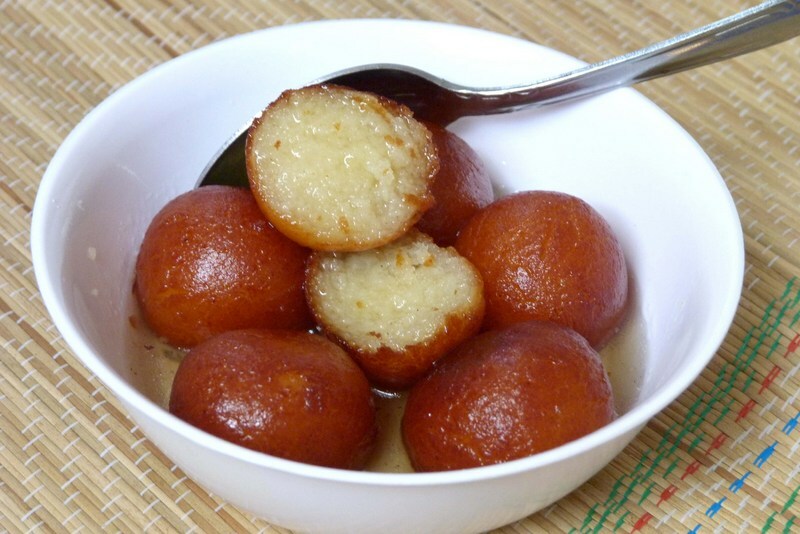 Gulab Jamun: Gulab jamun or Gulab jam is a milk-solid -based dessert, similar to a dumpling, popular in countries of the South Asian Subcontinent such as India, Sri Lanka, Nepal, Pakistan and Bangladesh. The term gulab jamun comes from Persian words gol (flower) and āb (water), referring to the rosewater-scented syrup. Gulab jamun is a dessert often eaten at festivals or major celebrations such as marriages, Muslim celebrations of Eid ul-Fitr and Eid al-Adha and Diwali (the Indian festival of light). There are various types of gulab jamun and every variety has a distinct taste and appearance. Mix the sugar and water and place over low heat, stirring till the sugar dissolves. Increase the heat once the sugar dissolves. Continue boiling over high flame, without stirring. Skim off any scum that collects on the sides of the pan. Cook the syrup till it reached 1-string consistency. Add in the green cardamom powder. Mash the khoya on a flat surface till it becomes smooth. Knead the mixture into firm dough. The dough should be firm but pliable and should not feel dry; if it does feel dry, wet your hands and work the dough again. Divide the dough into 12 equal sized portions. Shape each portion to a ball that is smooth and creaseless (the shape can be round or oblong). Heat the oil, in a deep bottomed pan or kadhai, on low heat, to 150°C. Add in the dough balls, without one touching the other. Fry the dough balls till golden brown in colour. Drain the fried dough balls. Transfer the fried dough balls to the sugar syrup. Let the jamuns (fried dough balls) soak for atleast half an hour. Gulab Jamun’s are ready to be served. Serve the gulab jamun hot, cold or at room temperature. If you have any queries regarding the Gulab Jamun recipe, please leave a comment.